Although upwards of 80 percent of the food on US supermarket shelves contains some genetically modified organism (GMO), it is not likely that the consumer is aware of it. The biotechnology and chemical companies that engineer GM crops and the pesticides used to protect them, such as Monsanto and DuPont, want to be sure that you remain unaware of which products your local supermarket offers contain genetically modified foods. These companies spent millions on a campaign to defeat a recent California proposition that would have required products containing GM ingredients to state so on the label. They used scaremongering tactics to convince the public that food prices would skyrocket due to the new labeling laws, and apparently did a good job of it. People voted against the proposition, apparently preferring to be part of a huge public health experiment to being informed consumers. The processed food industry was thrilled with the result, as they use a considerable amount of GM ingredients in their products and are aware that consumers would likely buy products from their organic competitors if they were aware of the GMO content. Based on a number of animal studies that showed fertility problems and changes to gut bacteria, The American Academy of Environmental Medicine (AAEM) felt the need to issue an advisory to doctors, suggesting they “educate their patients, the medical community, and the public to avoid GM (genetically modified) foods when possible and provide educational materials concerning the dangers of genetically modified foods.” The Food and Drug Administration has thus far refused to require any type of labeling on genetically engineered foods, saying they are “substantially equivalent” to conventional crops. • Make sure the label states that it is “100% organic” – Both U.S. and Canadian law requires that if a label states that the product is “100% organic,” it may not contain any genetically modified ingredient. This includes meat from animals that have eaten genetically modified feed. Keep in mind, however, that if the label states it is simply “organic” (not “100%”) it may still contain as much as 30% GMO ingredients. • Buy food with labels that specify the product is “non-GM” or “GMO-free”– Although it is still rare to find labels that state this, as the support for labeling increases, you will probably see it more often as manufacturers realize that informing consumers that their food is free of GMOs can give them an edge on the market. Conventionally grown food is indicated by a 4-digit number. Genetically modified food consists of a number with 5 digits that begins with an 8. 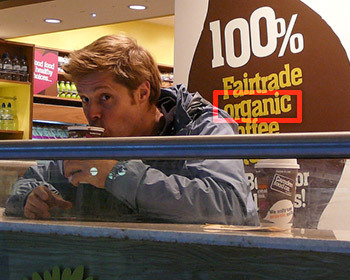 Organic food is indicated by a 5-digit number that begins with a 9. • Stay away from aspartame – NutraSweet® and Equal® are examples of artificial sweeteners that use aspartame, which is made from genetically modified microorganisms. Soybeans – In addition to the popular tofu, soy milk, and edamame, products such as soy flour, soy protein, soy lecithin and isoflavones may be a result of genetic engineering unless they carry an organic label. Corn – This is a product that is nearly impossible to avoid, as it is used in a staggering variety of processed foods, particularly those that use high fructose corn syrup. If a product has any type of corn in it, you may want to think twice about buying it unless it has been labeled as 100% organic. You are currently safe eating popcorn, however, as there is no genetically modified popcorn on the market at the moment. If you want that buttery taste, add some real melted butter yourself, as artificial “butter flavor” is usually a product of genetic engineering. Canola (Rapeseed) – If you live outside the EU (which has strict restrictions on GM products), 95% of the canola oil sold is derived from genetically modified rapeseed. Instead, choose sunflower oil or grapeseed oil, which are unlikely to come from GM crops. Dairy – Buy organic dairy products or those labeled as rBGH- or rBST-free. Conventionally raised dairy cows are routinely injected with these hormones of genetic engineering so as to boost milk production. They are also likely to eat genetically modified feed.